NHS England » What’s in store for nursing and midwifery in England? The first 100 days of any new role will always be a whirlwind of activity: people to meet, names to remember and new information to learn – and this has certainly been the case for me. It’s also been the chance to head around England, to gather thoughts and experiences from colleagues, to understand what is important to them, and how to feed this into my vision for the future of nursing and midwifery in England. And what a host of amazing people I’ve met. My very first day in the job began with the launch of the NHS Long Term Plan along with Simon Stevens at Alder Hey Children’s Hospital in Liverpool. Later that week I headed to Blackpool to talk with the Sustainability and Transformation Partnership (STP) and with nurse leaders from across the region, and then to shadow care teams and patients, to get a full picture of services and care experiences there. I’ve met with teams in prisons and in mental health trusts to understand the challenges that care staff and patients can face there, and with other Chief Nursing Officers (CNOs) to understand how our professions are working in other countries. I’ve spoken with amazing nursing leaders at the Queens Nursing Institute and to our leaders of the future at the launch of the new cohort of Florence Nightingale Foundation scholars. I’ve heard insightful updates from naval nursing colleagues in Portsmouth and from amazing army nurses in Lichfield. I’ve engaged with Infection Prevention Control (IPC) leads to launch the first national hand hygiene policy – a first step to aligning organisations to a single approach on this important issue. I’ve talked about nursing as a future career – for all genders – with children in Birmingham and about nursing experiences from the past with previous CNOs. I’ve put in place my senior team, and the first ever Chief Midwifery Officer for England. I’ve listened to the Department of Health and Social Care, to the Workforce Race Equality Standards team and of course to patients, nurses, midwives and care staff, from trusts right up and down England. Recruit and retain enough people with the skills we need. Build places of work that are rewarding, positive and filled with opportunity. Develop the quality of our management and leadership at every level. Tackle inequality and break down the barriers that are preventing too many from reaching their potential. Create an infrastructure that enables more volunteers to support our front-line staff. We need to renew the reputation of our profession for the future. We need firmly to establish our value and highlight the importance of what we do and why. And we must tackle the embedded stereotypes about our role, and raise the profile of what it is we do. The breadth of our role as nurses in prescribing, medicines safety, research and technical and clinical care is not understood enough. Ours is a highly skilled, educated profession and includes extraordinarily skilled people and leaders. It is crucial that we raise our profile if we are going to achieve any other goals we set for our future. Finally, we need to make sure our collective voice is powerful and heard. Too often our voices are missing from the conversations where decisions are made. We have to speak with confidence, understanding our value and knowing that our contribution is important. A collective voice enables collective leadership. Have I got these priorities right? These first 100 days have built a foundation, but what I also know is that this is not a job I can do on my own. I need colleagues to join me in #teamcno and I will keep listening and engaging – with colleagues, teams and patients right across the sector. 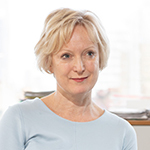 So please follow me on twitter @RMayNurseDir and keep in touch with your own experiences, ideas and suggestions, that will help us deliver health services our patients deserve.